My table saw recently went out of alignment and it was bad. For some reason while being tilted the motor mount got caught on the cabinet and went out of alignment by about 20 thou. I decided this was the time to make a jig and make it accurate as possible. I have heard many different views on how much out of alignment is acceptable and I figure it should be as close to perfect as possible. This way I can’t say my saw is out when something isn’t as accurately cut as it should have been. I managed to get it within 2 thou so all is good. I decided to use it on the fence while I was at it and it too is within 2 thou. The jig is made from scrap russian ply and a piece of scrap 2×6. Attached my dial indicator and voila, an accurate jig. You missed the opportunity to pay $74.99 from Rockler. Simple AND accurate. Can’t beat that. well, if your saw is contractor saw like mine, you gonna need this frequently like after every major job. if it has cabinet mounted trunnions you will need it once in saws life time. Router, this is the third time having to do this which is why I finaly made this jig. My saw is a Delta hybrid which has the trunions attached to table and they are very difficult to adjust. I think its time to upgrade to cabinet saw. excellent idea geek. Goin’ on the to do list. Thanks mate. Great work. I have a similar setup myself. Simple, cheap, and VERY effective. What could be better? Definitely gonna favorite this one. Man, could have used that two days ago. Thanks, I will have one soon. Great and practical. Thanks for the comments. It works great and it is one of those jigs I should have made a long time ago. And yes saving money is the best. You Dah Man! Always a great idea and execution. I got mine and love it. 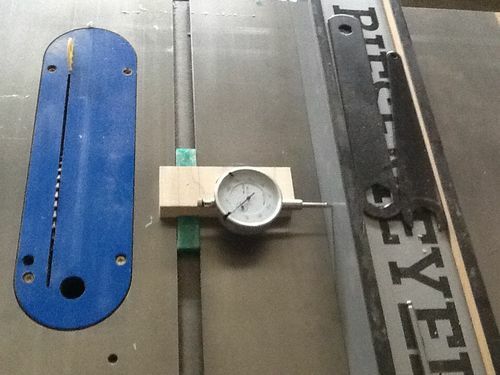 HF dial indicator, scrap poplar and scrap piece of plastic miter bar. $10 beat $79.99. I like simple, and I like precise. Good stuff. thanks all. I too like simple, precise and cheap. Saves me a little money which gets me a little closer to that new cabinet saw.